There are spare Mattress Covers to change the Sleeping Configuration from Single's to Doubles and Vis Versa should you prefer. You will find a cupboard full of games, colouring, bingo, etc... to keep you amused. You will find everything you need to cook for a Family of 8, including a Slow Cooker :). £75 deposit required to secure booking. Price quoted includes 2 Adult and 2 Children's passes. Extra passes will incur a cost. Dog's occasionally allowed, speak to owner. 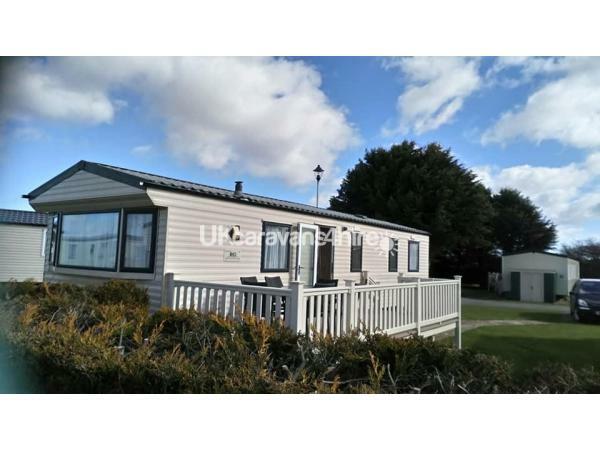 We have to rent our lovely Willerby 3 Bed Caravan, bought and set up in memory of our Beautiful Daughter, who died of DBA in 2016. ( please visit our Facebook page " LJ's Cha ra ban Rental" to read her story.) On entering the secluded cul de sac area of Sandhills on Butlin's Caravan Park. 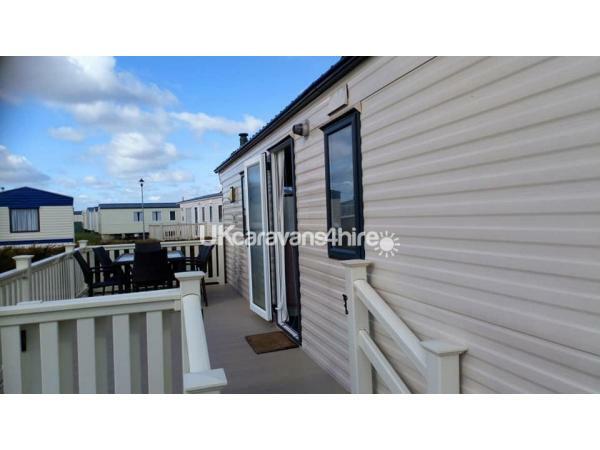 You will find room to park 2 cars, and will see the lovely large (12ft - 20ft) Veranda area to the side of the Caravan. 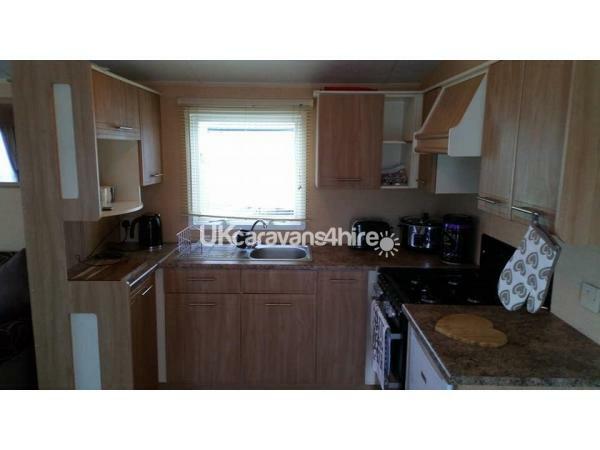 This is completely secure so you can leave the Caravan door open knowing little ones are safe. The large Lounge/Dining area has 32inch TV, BluRay/DVD Player with Remote Control. We have fitted an Electric Fire (which we feel is much safer than Gas for the little ones) for your comfort, although there is Central Heating throughout the Caravan. You will find lot's of games, etc... to occupy yourselves should the weather no be very kind to you, or for something quiet to do of an evening. There is also a High Chair for your use. There are Plastic Sheets for the Bed's, should you think you need to use them. The main Bedroom has a Hair Dryer. 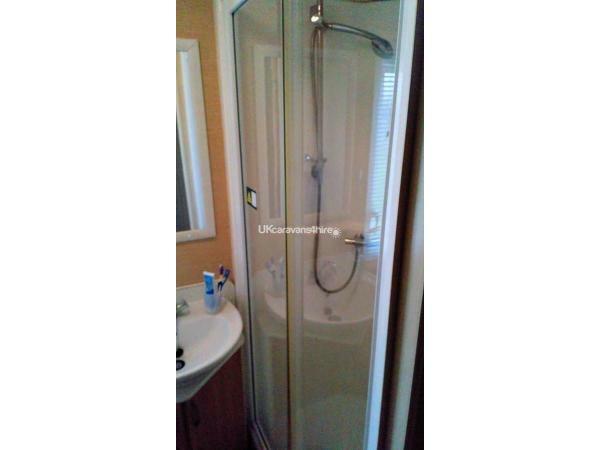 There is a large Shower Room ( my son is 6ft4in and can stand up in to shower easily) with on tap Hot Water. Also a separate WC and Wash Basin. The Veranda is lucky enough to be facing the Sun all day should you wish to just chill for the day, Patio furniture is there for your use, other wise, The Skyline Dome of Butlin's is only a stroll away. ( you can take the car if you wish) and your passes will gain you entry to everything it has to offer. Check out our face book page or Butlin's site itself to see just how much there is to enjoy. There is also private access to the beautiful Beach. The Famous Fantasy Island Theme Park and Market are with in Walking Distance (approx. 15 min stroll), if you prefer to take the car. Parking is £6 for the day and from there you can do the whole strip of Ingoldmels, right down to the beach. Alternatively Skegness is a 5 Min Drive with all it has to offer. Additional Info: Access to Beach. Fun Fair and Arcade's. New Splash World with Various Pools and Slides (All indoor), Large Splash Pool outside with Sun Loungers. There are Shop's and a Launderette on Site. If you wish to leave Butlin's and find some other entertainment, we are 10 min's way from the Famous Fantasy Island in one direction and Skegness Msin Centre in the other. Opposite us is the Local Beech with Various Restaurants and Night time Entertainment.